Note: The screengrabs here are from an earlier DVD release and not the Criterion Blu-ray being reviewed. Oh, the sick mind of a writer. And nothing so perverse as believing your particular brand of sickness is special. When I was done with Leandro, I drove over to a revival theatre in Santa Monica where they were showing an old Humphrey Bogart movie. 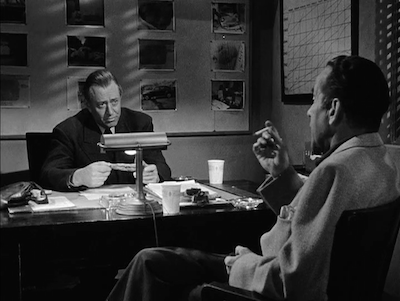 In a Lonely Place, 1950, directed by cinema himself, Nicholas Ray--a dark-side-of-Hollywood picture. While I was waiting for it to start, eating a box of Jordan almonds, I wondered what I would do next. Leo drew the line at giving me Adam’s address. He said that didn’t pop up right away, he’d have to go farther into the system, and that would leave fingerprints. I would have to find Adam some other way. Last I heard of him, after Brianne left him and we moved here and the divorce, he was still in Oregon working for that computer company. I didn’t suppose it would be too hard to find out if he was still there. Leaving the theatre, I noticed a poster advertising an upcoming retrospective of the films of Jean-Luc Godard. Images of Anna Karina and Jean-Paul Belmondo and Jean-Pierre Léaud. Temptresses, gangsters, and teenagers. I’d have to come back for that. Movies come up a lot in my book. And detective fiction. Rest assured, I’ll be taking a pretty heavy pair of scissors to the above. I can see tons of things I’d cut right now, get it down to the bones. Much like Dix eventually savages the book he’s meant to turn into a faithful screen version. The way the coat-check girl (Martha Stewart) describes the imagined romance novel, I can’t help but think of Leave Her ToHeaven, and maybe that’s the kind of sharpness Dix brings to his script. We can only guess. All we know of the unseen screenplay is what the onscreen author tells us. Dix is a sinister storyteller, one who doesn’t shy away from the more gruesome details of a plot. 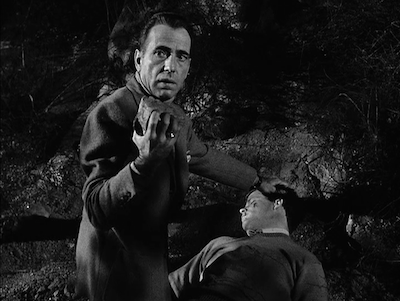 Naturally, when the police, including an old buddy from his army days who’s now turned detective (Frank Lovejoy, The Hitch-Hiker [review]), show the wordsmith the murder scene photos and outline their own timeline for how Dix killed the girl, he starts to puzzle through the potential suspects and motives himself. 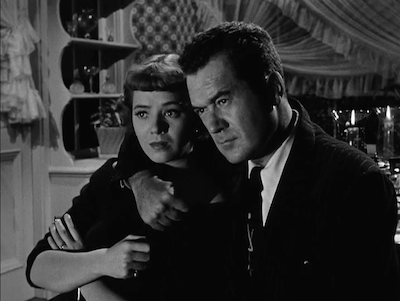 He even relays his own version to that buddy and his wife (Jeff Donnell, The Sweet Smell ofSuccess). As he spins the yarn, directing them at to act it out at the same time, Ray and director of photography Burnett Guffey (The Strange One [review]) isolate the light on Bogart’s face, making it look the way it does when a kid telling ghost stories at camp holds a flashlight under his chin. The irony is Dix can’t imagine himself doing it, despite every one else thinking he probably did. Or, to clarify, he can’t imagine himself doing this particular murder. He never wavers in his belief he didn’t, not even when he cruelly jokes with his agent that maybe he did. There’s truth in that wicked humor, and little that Dix is capable of some pretty nasty business. He has violent spells that give everyone pause. The same light lands on him when the moods take over, a visual cue to let us know that we are heading into darkness. It’s almost supernatural--even if now we recognize him as a man with anger management problems, perhaps even some PTSD from his combat service, and the classic patterns of an abuser. He erupts, attacks, and then is sorry, making amends through grand gestures and promises to never do it again. Dix is a hard man to like, and yet we do anyway, because he’s still Humphrey Bogart. Playing on the actor’s star power, Ray messes with our perceptions. We have a feeling Bogart is the good guy, because he most often is, and so we put our faith where no one else can. In essence, we are the lover that the actress who falls for Dix can’t be, because we put aside our doubts and put our faith in the supposed inevitability of a Hollywood happy ending. The noir twist here is how the stories about the writer, rather than the ones he crafts himself, take their toll on Laurel (played by Nicholas Ray’s real-life (and estranged) wife Gloria Grahame (The Big Heat, Sudden Fear [review]). Laurel lets her imagination get the better of her; she can’t separate the violence she’s witnessed from the violence Dix is accused of perpetrating. It’s a shame when you let a thing like a dead body get in the way of a good love story, but then again, as Dix explains, “A good love scene should be about something else besides love...Anyone can look at us and tell we’re in love.” This little bit of poetry is delivered during the scene where the film really turns. He’s making her breakfast, and Laurel is groggy, having taken sleeping pills to (unsuccessfully) block out her nightmares about Dix beating another man. Where earlier in the film she saves him with her alibi and pulls him out of his slump by taking care of him, now he’s her caretaker, right down to the domestic chores--though the results aren’t quite the same. 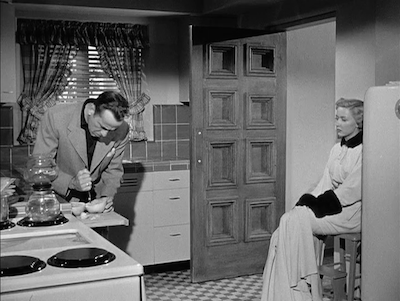 There is a wonderful metaphor embedded in this scene: Dix is trying to prepare Laurel’s breakfast grapefruit, but he is having a hard time because he has straightened out the curve in the grapefruit knife, thinking the bend is not supposed to be there. All the better for stabbing things with...? Bogart and Grahame are a natural screen pairing. They are attractive and confident, and they both have a bit of a speech impediment. She is aloof, and then a rock, and then a bundle of nerves that grows more tangled even as she unravels. (Dix will never straight her out!) Fascinatingly enough, Laurel’s not opportunistic. The failed actress never pushes the more successful scribe for a part in his new movie. This makes Laurel less the femme fatale and more the stable good girl. Dix has no nemesis but the one buried inside him. Nicholas Ray manages to both have his tongue in his cheek when dealing with this Hollywood nonsense and be perfectly serious when relaying the rest of his tale. 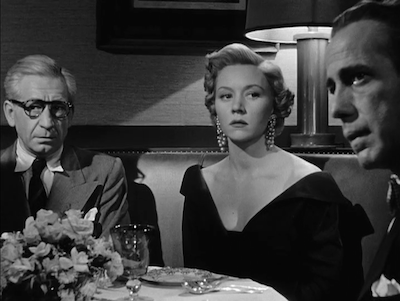 In a Lonely Place goes to some deep recesses and sifts around in the muck, yet it also maintains the aura of illusion. The scenes around Dix and Laurel’s apartment complex are played with an almost sitcom-like airiness. It’s classic Hollywood at its finest, and also a subversive, self-reflexive tribute to the system that spawned it. Joining the pair is a cast of eccentric characters and Hollywood types: a nebbish agent, a one-time matinee idol turned drunk, a controlling masseuse, a raven-haired actress on the prowl, the producer that’s also the son-in-law of a studio chief and whom no one respects. All that’s missing is a studio fixer. Even the coat-check girl is a type, she’s the wide-eyed movie fan who can’t believe she’s rubbing elbows with celebrities. 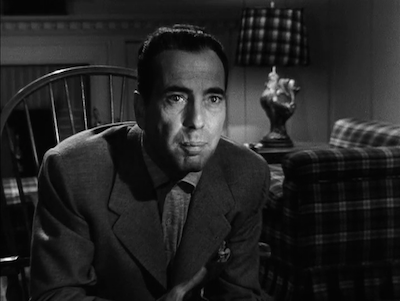 In a Lonely Place is a cautionary tale: motion pictures are a deadly business. 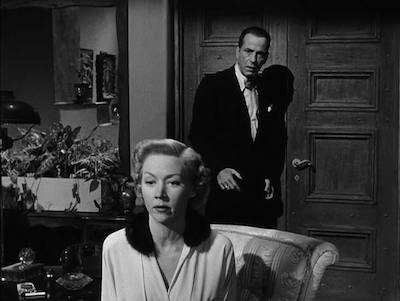 Elsewhere on Criterion’s disc of In a Lonely Place, the camera is turned on the filmmaker. The 1975 documentary I’m a Stranger Here Myself caught up with Nicholas Ray while he was working as a teacher, at the time he was shooting We Can’t Go Home Again [review]. The movie details Ray’s cinematic philosophy, shedding light on his approach to character, his championing of the outsider, and how he expects to communicate with the audience. John Houseman, Natalie Wood, Francois Truffaut, and others also chime in to talk about the filmmaker. Early in the doc’, Ray talks directly about In a Lonely Place, including how he came to the film’s knockout ending. 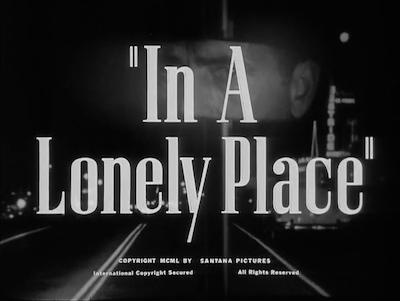 Among the other extras is a 1948 radio adaptation of Dorothy B. Hughes original novel for In a Lonely Place. (Hughes also wrote the source book of Ride the Pink Horse.) Performed for the Suspense series, it stars Robert Montgomery as Dixon Steele, a would-be novelist and serial strangler. Though a Los Angeles story, there are no Hollywood trappings, and the portrayal of Dix’s compulsive behavior is far less complex, despite being related from a first-person point of view. 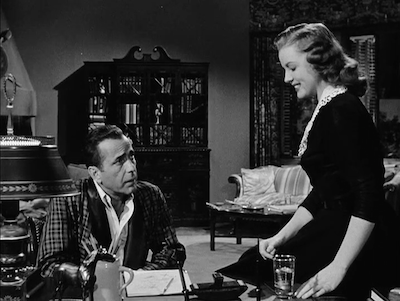 Is it possible Bogart’s dismissal of then novel he’s supposed to adapt in the movie version a meta joke about In a Lonely Place’s own source material.